Is Whole Foods starting to shed its “Whole Paycheck” reputation? Stock analysts have noted downward pressure on prices as conventional grocery stores expand their organic and “natural” offerings. That’s led to lower margins for Whole Foods Market — and bargains for shoppers who know where to look. In a recent price survey, Cheapism.com zeroed in on 25 products that cost less than their equivalents at a nearby Safeway. Read on to find out what they are (and head to Cheapism for a the complete list of Whole Foods prices). 1. Organic milk. The 365 Everyday Value store brand promises savings on a wide range of items. Here it trumps Safeway’s O Organics brand with a price of $4.99 vs. $5.29 a gallon. 2. Non-dairy milk. A broad selection at Whole Foods includes Califia Farms almond milk for 60 cents less than the same item at Safeway. The conventional supermarket carries name-brand rice milk for $2.59, whereas Whole Foods offers a store brand for $1.69. 3. Shredded mozzarella. Consumers who’ve raised their eyebrows at the cost of cheese at Whole Foods can safely reach for a 16-ounce bag of 365 Everyday Value mozzarella, which costs $3.99 vs. $4.49 for Safeway’s Lucerne brand. 4. Extra virgin olive oil. This may be the best value at Whole Foods: $4 off a 33.8-ounce bottle of store-brand olive oil, whether shoppers choose conventional or organic. 5. Organic balsamic vinegar. To complement the olive oil, Whole Foods offers 365 Everyday Value balsamic for $3.69. Compare that with $6.29 for the same size bottle of O Organics at Safeway. 6. Nutrition bars. Relying on energy bars for a boost between meals can quickly become an expensive habit. It’s slightly less so at Whole Foods, where Larabars cost $1.29 instead of $1.50 and Kind bars go for $1.49 vs. $1.67. 7. Organic popcorn. Consumers wary of genetically modified corn can munch on a bag of store-brand organic popcorn for $1.99 compared with $2.69 at Safeway. 8. Pretzels. Whole Foods customers get more for less, paying $1.89 for a 16-ounce bag of 365 Everyday Value pretzels rather than $2.49 for 13 ounces of Safeway’s Snack Artist pretzels. 9. Organic frozen vegetables. Conventional veggies cost less at Safeway, but shoppers who buy organic will find peas and corn up to $1 cheaper at Whole Foods. 10. Organic quinoa. 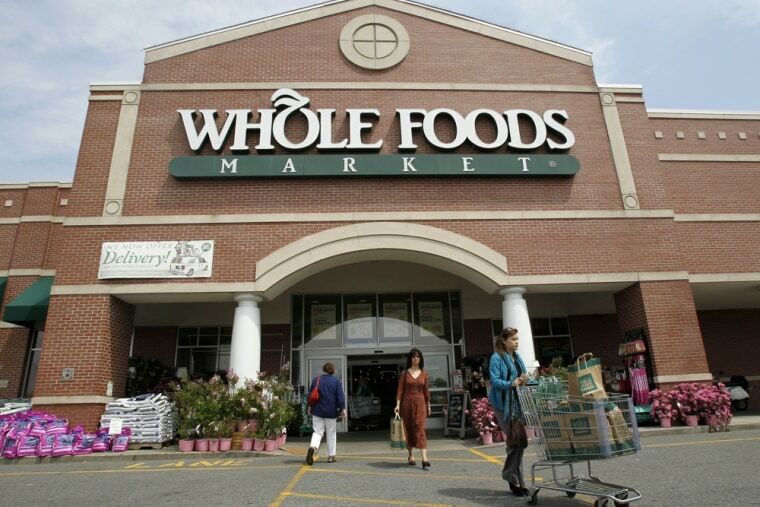 Any item that’s organic and somewhat unconventional is liable to cost less at Whole Foods. The price for a 16-ounce bag: $4.49 compared with $5.19 at Safeway. 11. Organic chicken broth. At $1.99, Whole Foods’ private-label broth beats out Safeway’s O Organics ($2.59) and the even pricier Pacific brand ($3.29 to $3.69). 12. Organic pasta sauce. It costs $2.29 to top off spaghetti with 365 Everyday Value sauce from Whole Foods, a 50-cent savings over the same size jar of O Organics at Safeway. 13. Elbow macaroni. While at Whole Foods, it’s worth grabbing a 16-ounce bag of pasta for 99 cents, a small savings over Safeway’s $1.29 offering. 14. Organic sweeteners. Light brown sugar sells for $3.49 and powdered sugar for $3.99 compared with $4.29 at Safeway. Raw agave nectar comes in a different size at each store but totals a little more than half the price per ounce at Whole Foods. 15. Organic coconut oil. Consumers are turning to coconut oil for cooking, moisturizing, seemingly everything under the sun (literally — it’s a natural sunscreen). Whereas Safeway carries the Spectrum brand for $8.39, Whole Foods includes a jar in its 365 Everyday Value line for $5.99. 16. Organic condiments. Shoppers replenishing the refrigerator door before barbecue season can come out ahead at Whole Foods, where store-brand ketchup and mustard cost less per ounce than their O Organics counterparts. 17. EnviroKidz cereals. In this case, the exact same Nature’s Path organic cereals that command $3.79 at Safeway sell for $2.99 at Whole Foods. 18. Peanut butter. Families who go through a lot of peanut butter can save 20 cents on each 18-ounce jar by opting for 365 Everyday Value over Safeway Kitchens. 19. Cereal bars. Whole Foods squeaks out another win with a box of six store-brand bars for $1.99 vs. eight Eating Right bars for $2.99 at Safeway. That’s 33 cents vs. 37 cents per bar. 20. Paper towels. An eight-roll package at Whole Foods not only costs 50 cents less than the Safeway Home brand; it also contains almost 45 more square feet of paper towel. 21. Dog biscuits. The recently launched Whole Paws line of pet products includes a 20-ounce box of dog biscuits for $3.99. Safeway sells Milkbone-brand biscuits in a 24-ounce box for $4.99, leaving Whole Foods with a slight edge. 22. Roasted whole nuts. The same outlay of $5.99 buys 16 ounces of almonds at Whole Foods and only 9 ounces at Safeway. 23. Organic russet potatoes. Consumers who’ve seen potatoes listed among the “Dirty Dozen” can go organic at Whole Foods for $1.49 per pound instead of $2 per pound at Safeway. 24. Cream cheese. Those who constantly nosh on bagels or enjoy baking cheesecake will appreciate a bit of a break on store-brand cream cheese, which costs $1.69 vs. $1.79. 25. Meatless frozen foods. Although the meat counter won’t attract bargain hunters, vegetarians will find an expansive selection of cheap substitutes, including store-brand soy burgers for 50 cents less than Boca burgers. What’s the best cheap grocery store? Is outlet shopping always cheaper than retail?